The Outdoor Lights, Inc operates under both a Low Voltage and High Voltage Electrical License and we have been recognized by the Better Business Bureau. You can trust our professional installers because we have been enrolled in the Drug Free Workplace Program since 2004 and have volunteered to E-Verify all employees to confirm they are legally able to work in the United States. Our installation crew leader has been employed with us since 2003. He and the entire crew go through constant training and testing to ensure you a trouble free installation. Furthermore, we carry liability insurance to keep our crew members as well as our customers protected in case of an accident. 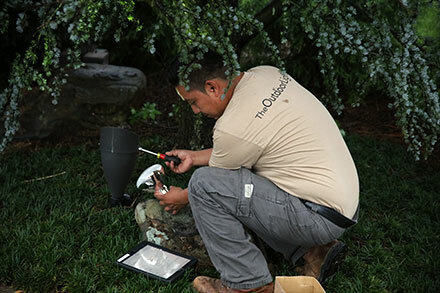 We take these precautions so that your experience with The Outdoor Lights, Inc. is exceptional from beginning to end. For any project in the Southeast U.S., we can install and service your lighting system. For those customers that we design for outside of the Southeast, we can help you by supervising the job through a local qualified lighting firm. We will interview and research the background of any potential lighting contractor; to make sure you get a licensed, insured, and competent contractor that will professionally install your system. We will meet the contractor on site to strategically place each light as it was designed, and to make sure the job is completed per the design specifications. Our management fee depends on your location and the size of your lighting design. Please contact us for details. How to choose a lighting contractor. Research your contractor on the internet and on the BBB website. 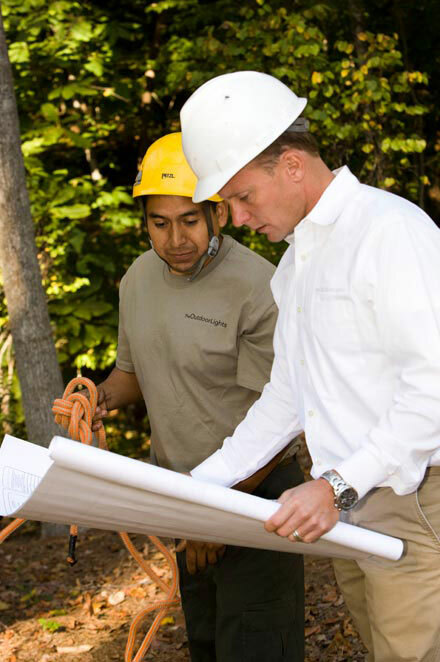 Make sure the contractor has adequate Insurance including workers compensation. Get the contract in writing. Make sure the contract lists exactly what work is to be performed and what the cost is. Get a list of the materials to be used, and how the warranties are structured. Ask for proof that the company participates in the Drug Free Workplace program. Ask for proof of the Soil and Erosion Control certificate. Check their references, and ask if you can view some of their completed projects.